With 7 kids and a grandbaby, I need equipment and processes that are quick, easy and fun to use. Not only for myself but for my whole family – kids included. Many people enjoy using these products. 99% of these products listed below I personally use and highly recommend. The other 1% I want to order in the near future because they would be wonderful to have. A lot of research has gone into finding the right products to use in my kitchen. I have looked over the reviews, compared to other products and spent a lot of time making sure I made the right decision. That’s why I am confident in sharing these products with you. I am sure you will find this resource page very useful. aI look for things that speed up the cooking process. Time is precious and I can appreciate that. aI look for things that are easy for the whole family to use. I have many tools and equipment that are children friendly. aI look for things that the family can use to be creative. It’s nice when family/friends/co-workers can have a good time together working in group activities such as cooking. aI look for 5 star ratings… and a lot of them! I want to make sure what I am buying has good reviews and provides great service. aI look for products that are reasonably priced. I want to purchase an affordable yet very reliable product. Page navigation Tools: Click on product name or photo to see product details and ordering information. Below is a list of products I use. 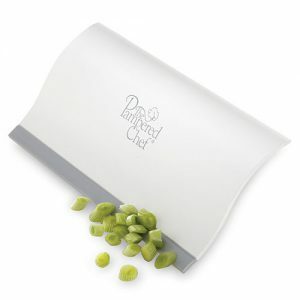 Removable cooking sheet is easy to clean, Handmade terracotta done for exceptional flavor! 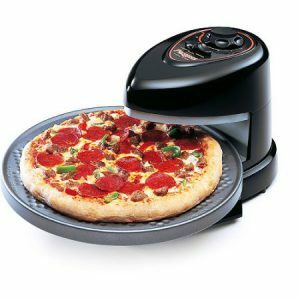 We use it for: Making amazing pizza’s. Fun for the family! Easy to make and cleanup. We have made many allergy friendly pizza’s. Check out our selections at Farr Better Recipes. About: Rotating tray turns continuously to assure even baking. 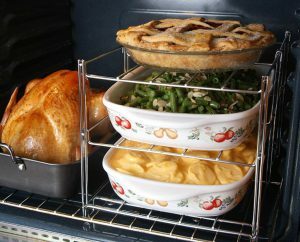 Top and bottom heating elements bake foods from both sides. Heating elements are separately controlled, allowing you to select top, bottom, or both elements for perfect results every time. Features: Timer signals end of cooking time and automatically turns off heating elements. Saves as much as 60% in energy compared to a conventional oven., Removable nonstick baking pan is easy to clean and store. We use it for: Enjoying fried food without the guilt! It air fries, bakes, steams, sautes, grills and roasts. I have made such amazing meals with this. About: It does all the thinking for you, and when the timer is done, the automatic shut-off stops the cooking cycle. Simply add your food to the easy load basket, slide it into the unit, and with the touch of a finger select your cooking setting from one of the 7 preset programs. 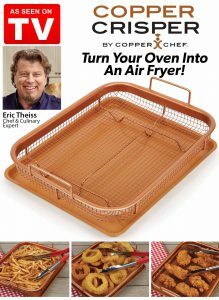 About: This steel nonstick copper crisper tray allows air to circulate around your food for crispy results without flipping. No turning, no burning! Food cooks evenly on all sides. Healthier than frying your food. 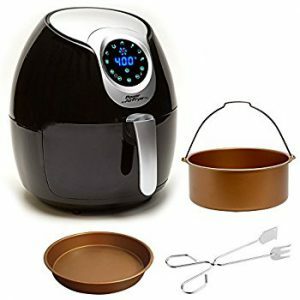 Features: Non-stick copper tray catches crumbs, drips and splatter. Cook without butter or oil. Heat resistant to 850 degrees F. Easy clean up. We use it for: So many things. It’s nice the Farr Better Recipes work well with many types of kitchen equipment. We like this healthy option of heating up food. Plus it cooks 50% faster and is up to 75% more energy efficient than a conventional oven. About: Cooks quickly and evenly, without preheating or defrosting. Great for health diet, it leaves food moist on the inside and brown and crispy on the outside while containing minimum fat or oil. 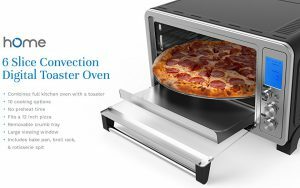 Choose from many setting options to match your meal, this innovative cooking appliance does everything a conventional oven can do, only better, faster, and with substantially less power consumption. Features: Able to Bake, Grill, Steam or Roast. Easy to clean glass. 2 wire cooking racks and plate tong. Baking up to 482 degrees F.
We use it for: Love using it for our Farr Better Recipes. Makes any meal delicious! 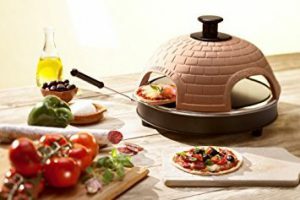 This style oven has so many possibilities. 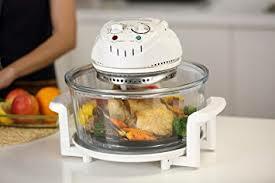 We use it for: An awesome space saver allowing you to cook multiple items at once. About: Bakes up to 3 tiers of heavy casseroles. With a big family, this comes in handy. Great for larger gatherings too, like for the holidays. 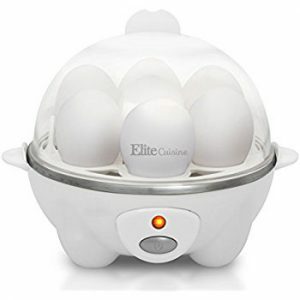 We use it for: Cook up to 7 eggs in soft, medium or hard boiled firmness. Saves time and water while making them perfect every time. Shell is easy to peel and cleanup is easy. Tip: Use White Distilled Vinegar to clean water residue. Let it soak for 15 minutes or more on the silver plate and it wipes right out, making it look like new again. About: It’s about cooking eggs to your preferred desired firmness. Tip: To peel shells easier from hard boiled eggs, put eggs in an ice bath for about 5 minutes. The eggs will be cool to the touch. Then give them several taps against a hard surface and large shell pieces peel off quite easy. Features: I love the accessories. Nice water measuring cup that indicates amount needed for desired firmness. There is a pin on the bottom of the measuring cup to poke egg about 4 times to help cook to perfection. Also has nice egg tray, poaching tray and omelet tray. We use it for: Our daughter enjoys using this at college. It’s a nice convenient size. She uses it for her protein shakes but also to make some of our Farr Better Recipes. It’s wonderful for blending Garlic Whipped Cauliflower Mash (aka: substitute for mashed potatoes). Features: 2 speeds to control action, stainless steel with detachable foot – ease of cleaning. Nice ergonomic handle and control switch. Perfect gift idea! We use it for: Love this product! We use it all the time. Blends and makes our protein shakes so smooth. It cuts down on prep time with many Farr Better Recipes. 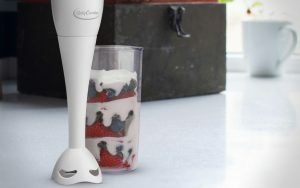 About: Makes delicious and healthy smoothies, pureed soups, marinades and sauces just the way you want it. Fits most mixing bowls, pots and beakers. So versatile. 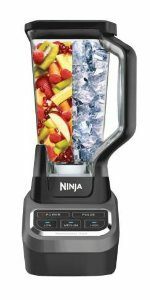 POWERFUL – Equipped with a high-speed 300-Watt motor, it quickly and seamlessly blends ingredients together to make delicious and healthy smoothies, purees, creamy soups, marinades, sauces, juices, and much more. SLEEK & ERGONOMIC – Its motor-housing body is sleek and ergonomically designed with a non-slip and easy-to-grip handle that feels sturdy and comfortable in your hand, so blending never feels like a chore. HEAVY-DUTY & COMPACT – Its Slim-Stick immersion shaft is made of 304 grade stainless steel, and was carefully designed to be able to fit most mixing bowls, pots, and beakers for your everyday needs. 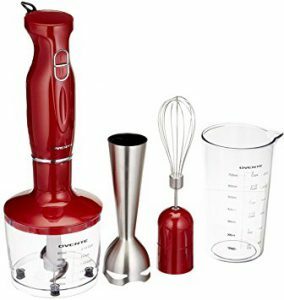 INCREDIBLE VALUE – Includes BPA-Free and dishwasher-safe attachments: stainless steel mixing stick, stainless steel egg whisk, food chopper attachment, and heavy-duty Tritan beaker (24 oz) with cup measurements. 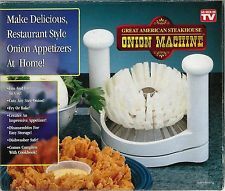 We use it for: It’s great for an impressive and delicious Blooming/Flowered Onion. I have a wonderful allergy friendly batter provided by our Farr Better Recipes. I also came up with the best allergy friendly Farr Better Seasoned Sour Cream to dip the onion in. We use it for: We received this as a gift from our sweet Aunt. My grandson “Tons of Fun” calls it his garden and helps maintain it. He’s 4 years old. Getting him started young in appreciating home grown food. It has been perfect having fresh herbs at my fingertips. We always encourage using fresh herbs and vegetables so you are exposed to less allergens. Features: High performance, energy efficient 20 Watt LED lighting for plants, A compact, beautiful design that will fit easily on your countertop, Includes 6-Pod Gourmet Herb Seed Pod Kit that contains: Genovese Basil, Chives, Cilantro, Curly Parsley, Dill, Mint & 3 oz. liquid plant food. 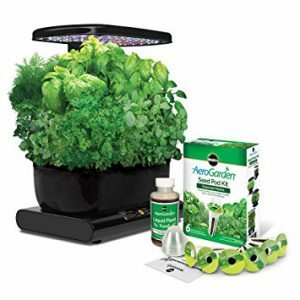 We use it for: Now that you have grown your own herbs with the AeroGarden Harvest with Gourmet Herb Seed Pod Kit, now you are able to chop your herbs in seconds rather than in minutes. It’s safe and gentle on the herbs to preserve it’s freshness in your dish. I love how fast and efficient I am by using these. They are my right hand partner. About: Food-grade stainless steel kitchen shears, heavy-duty steel rivets hold the herb scissors blades together securely so they always perform consistently. Ideal for Basil, Thyme, Dill, Parsley, Chives, Mint, Cilantro, and more. 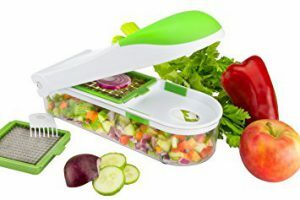 Features: Easy, non-slip grip ideal for cutting, chopping and mincing herbs in no time. Comb to clean the clinging herbs off the scissors. We use it for: You can cut greens, vegetables and other products right in the pan, bowl or frying pan quickly and easily, and there’s no need to wash your working surface after cutting. About: Clever food cutter made from food-grade stainless steel, can keeps rust-proof and tarnish-proof over time, different from most kitchen knives. The silicone grips are based on the ergonomic design that will comfort the palm of your hands.Make cooking easy and enjoyable. Locking safety hinge helps prevent accidental cuts. Features: can be washed in the dishwasher or by hand under warm water right after usage. 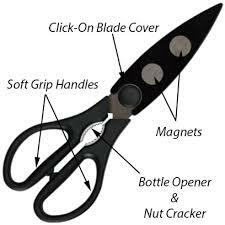 Knife detachable for ease of additional cutting purposes. We use it for: This is so handy for cutting packages open. But then it serves many other purposes too. Great product to cut just about anything. About: SHARP STRONG DURABLE STAINLESS STEEL BLADES – super sharp heavy duty blades mean you are able to easily cut through anything with minimum effort like a hot knife through butter. The blades are thick and made of corrosion resistant stainless steel. You will love them! LARGE SOFT GRIP HANDLES – extremely comfortable handles provide better grip and help prevent blisters and sore fingers! Suitable for both right and left handed users. 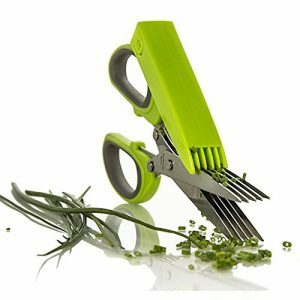 MULTI-FUNCTION HEAVY DUTY SHEARS – can be used for any task in the kitchen and around the home; cutting poultry, meat, chicken, fish, bones, vegetables, fruit, herbs, plants, paper, packaging, cardboard, fabric, for crafting, and more. The built-in BOTTLE OPENER / NUT CRACKER is a handy accessory for quickly opening tough to open bottles and cracking open all of your favorite nuts! We use it for: Nice and light weight electric knife for carving the Thanksgiving Turkey. You will love the wood block storage tray. Ideas to use this tool year round: Gently cut angel food cake, bread, turkey, ham, chicken, roasts, pork loin, ice cream cake or filled cake like a Boston Cream Pie or pates, baguettes… and how about carving a pumpkin? 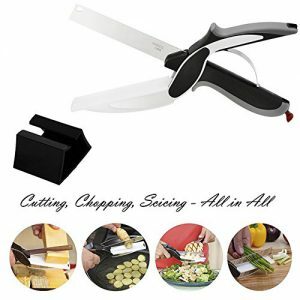 About: Making it easier for carving meat, 2 different blades for cutting vegetables and bread. Easy blade release mechanism to pop blades from the knife. A one touch pressure activated on/off trigger control system means you can concentrate on holding and guiding the knife rather than worry about buttons and activation. The design of this tool makes it convenient for left or right handed use. 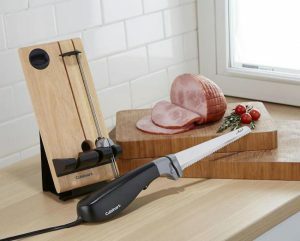 Features: Includes bread blade, carving blade and butcher block holding tray, ergonomic handle. What we use it for: I make this amazing vegan cheese ball from Farr Better Recipes. This is the perfect tool to use for making it. Also perfect for smoothies. I love this machine! We use it for: Everything you can imagine that needs to be chopped up. Reduce prep time with this powerful, easy to use product. Chop, slice, shred, mix and puree just about anything you put in the bowl. Fast and easy to use. I love the larger 14 cup food processor to fit our cooking style. About: Works perfect for prepping the Farr Better Recipes. Features: Fits whole foods, additional 5 cup bowl chops and purees small amounts, powerful performance with 525 Watt motor, 3 speeds and pulse. We use it for: I love how the food is contained in a tray. Less mess to clean up. Many of our Farr Better Recipes include fresh chopped vegetables. 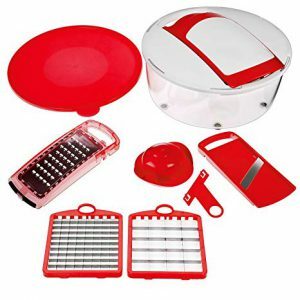 This product is perfect because you can choose the size of the chopped pieces with the discs. We use it for: This is such a nice product to make a salad for the dinner table. 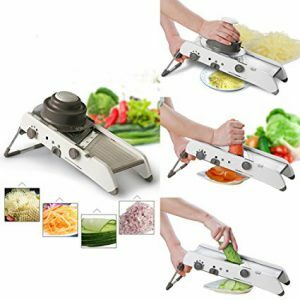 Chops the lettuce and veggies perfectly because of the adjustable discs. Best part is a beautiful bowl to hold all these items. Simple and easy cleanup. This is Genius! We use it for: Again, this is for achieving that perfect cut for that perfect dish you are preparing from Farr Better Recipes. 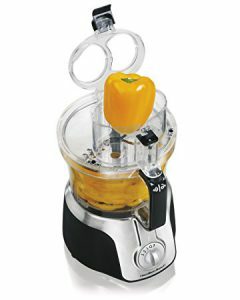 About: Chop large pieces of fruit, vegetables, boneless meats, herbs, nuts and even ice by hand with this handy chopper. It usually only takes me 4 pulls to get the perfect size each time. 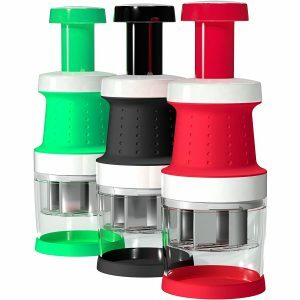 Features: Perfect for whipping up batches of pesto, hummus, salsa, guacamole and more. Comes with sealing storage lid. Great for small kitchens, RV’s, travel and camping. We use it for: This is perfect for chopping nuts. We love using it for onions, mushrooms, garlic and more. Simple and fun to use. Pick the chopper that creates the perfect cut for your dish. We use it for: Making our Zucchini and Squash veggie noodles. We especially enjoy it in our Creamy Turkey Stroganoff with Fresh Vegetable Noodles and our Creamy Vegan Stroganoff with Fresh Vegetable Noodles recipes from Farr Better Recipes. About: Perfect, delicious pasta without the carbs. 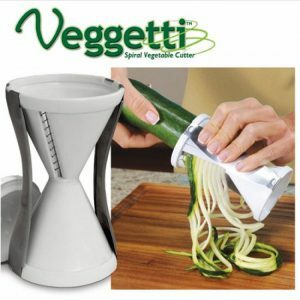 Makes veggie spaghetti, stir-fries, Juliennes and more. Great for zucchini, squash, carrots, cucumbers and potatoes. Features: Plastic spiral slicer has dual stainless-steel cutting blades for thick or thin pasta strands. We use it for: I love this little tool. I appreciate the rubber bottom for scraping food off another surface and scooping it up into a bowl or pan. It’s very handy! About: Making food prepping simple and easy! Features: Plastic with rubber bottom. Fits nicely in your hand. Dishwasher safe. We keep updating this page as we are constantly searching for new products to make cooking fun and easy.